Gmail is our favorite email service for both personal and business communications. The company has updated its platform recently with a couple of features like confidential mode, smart compose, nudge, and snoozing emails. They are useful to improve the productivity and efficiency in the work. The confidential mode is the most important addition among others that help you protect private emails with an expiry date and SMS Passcode. We can’t mention the added features as innovative. Because some other messaging apps have implemented them a long back for the sake of user privacy. Google has just followed those apps recently. Though it is late, the new Gmail update made our communications further smarter and easier. But still, Gmail misses a major feature which should be there well before. Do you know what’s that? Email tracking. We need to track emails to know when it is opened, how many times and the number of times a user clicks on the campaign links. You can easily track such user activities with third-party email marketing tools. I know. But now we are talking about Gmail and not about complex email marketing campaigns. We covered a post on Gmail email tracking tools a couple of months back. Learn How to Get Read Receipts on Gmail. Unfortunately, those apps will add a signature to every email you send and let the recipients know about the tracking. It’s a bad idea. I was using one of the mentioned tools until I found a powerful Gmail tracking tool recently. This is Snov.io Email Tracker. This is a free email tracking tool for Gmail users to know when recipients open emails and links. It is simple, easy to configure which you can use to track unlimited emails and accounts. You will get real-time desktop notifications when the email message is opened or a link is clicked. Today I’ll tell you how to track your Gmail emails for free with Snov.io. Snov.io can be set up in a few moments. Install its Google Chrome extension to track emails that you send through Gmail. A notification box will appear to get the installation permission. Click the Add extension button to proceed. Once installed, Snov.io will connect you to the Gmail account automatically. Click the blue color tick mark icon (Chrome extension) on the top of the browser to view tracking settings. It will show all the Gmail accounts signed on the browser. Drag the toggle button to the right to turn on email tracking for the respective accounts. Message and link tracking are enabled by default. Scheduling. So, you can send a message at a specific time. Reminder. If the message was not read, got no link clicks or no replies, you will receive an email letting you know about that. So, you will be able to send another email to this particular person. Disable tracking. 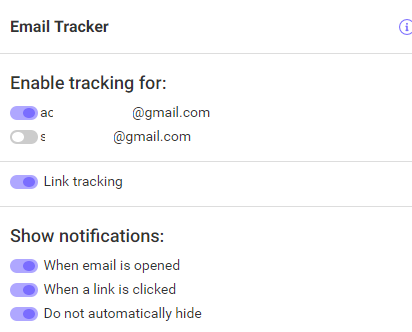 If for some reason you don’t want to track this or that email, you can turn the tracking off. When you’ve written the email, click the Send button. Snov.io will track the emails and notify you in the form of desktop push notifications when the recipient opens the message or click links in it. Alternatively, visit the Sent folder to view the full tracking history of the emails. Open a sent email to get the full tracking report. 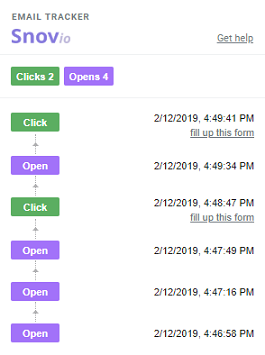 The tool provides detailed reports of the lead’s activities including the date and time of opening the message, date and time of clicking the links, and the number of times they performed this or that action. Snov.io is absolutely free to use. 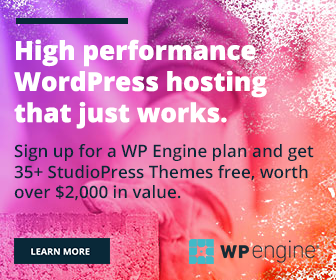 If you are working on a limited budget and want to track email campaigns without paying anything, it is a great tool to use. Other free email tracking tools will show a signature in the bottom of your messages and inform the leads about your spying. But Snov.io is a signature-free solution to track your Gmail emails secretly from the back-end. Are you using any email tracking tools? Feel free to share your thoughts through comments. How Far Have Technology and Social Media come? A Brief Look at the Advancements Made So Far!